The Model DW780A is a high resolution programmable bench scale complete with memory to store part numbers and average piece weights. 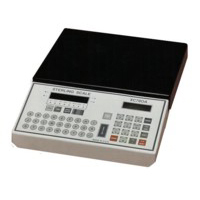 Features include a easy to read weight display, a prompting display, Alpha numeric key board, memory for 300 part numbers and 150 transactions. Optional memory is available if required. Portable cart for to transport the XC780A where needed.Â Painted mild steel 30" h x 24"d x 30"w.